Dumbo, the Flying Elephant, is one of Disneyland's most classic rides and one of the best photo opportunities for parents. 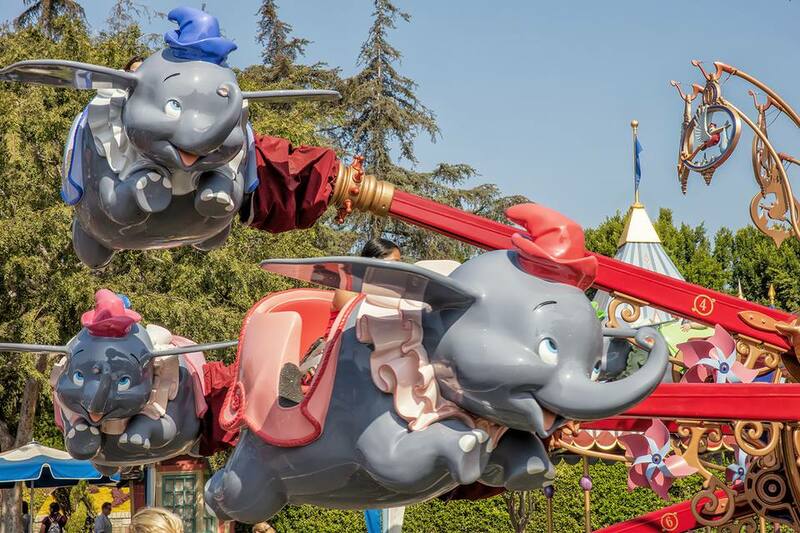 The ride is based on the 1941 animated film "Dumbo" which is about a little elephant with big ears who could fly. Sixteen elephant-shaped cars move up and down while going in a circle. Riders control how high they fly with the push of a lever. When you take off, it's like that moment at the end of the film when Dumbo spreads his ears and — seven can you believe it — flies. Dumbo the Flying Elephant is a must-ride for children five years old and younger and why not? Who doesn't want to fly on an elephant? In fact, Dumbo is many preschoolers' favorite Disneyland ride. It's hard to believe, but ordinarily impatient four-year-olds have been known to voluntarily wait 90 minutes in scorching mid-day sun just for their short flight. Thankfully the standing in the sun part of that wait was fixed in 2018 when Disney redesigned the queue for the first time since Disneyland opened. You may still have to stand in line with that squirmy, anxious kid but you can do it in a really cute area with shaded structures that look like circus tents. Location: Dumbo is in Fantasyland. Wait Factor: Medium. This ride doesn't have a FASTPASS. Lines tend to be shortest during the first couple of hours in the morning and again in the evening. Seating: Ride vehicles look like an elephant. Each one has one bench seat that's big enough for two adults or one adult and two children, although two adults might be more comfortable riding separately. You step slightly up to get in. Don't miss out by going at the wrong time. Dumbo the Flying Elephant closes intermittently to accommodate fireworks performances. Like any other attraction at Disneyland, Dumbo also sometimes closes for maintenance, renovation, or upgrades. To find out, check the Park Hours tab of the monthly calendar page to see what's being worked on. If you plan to take pictures of your little one on this ride, try to do it while they're low, just as the ride starts or stops. Or you can find a stationary Dumbo just behind the main attraction, which is ideal for getting that perfect shot. About seating: In theory, the ride vehicle should fit one adult and two kids, but it's a really a tight fit. It might be better to give the kids an elephant to themselves if they're old enough. If you have two kids and it's possible to split them up, it's best to put only one child in each vehicle, so they don't fight over the control stick. Dumbo is perfect for the little ones, but it's only one of the kid-friendly rides at Disneyland. Dumbo the Flying Elephant opened in 1955 but was not ready for opening day. It was remodeled 1983. The original plan was to paint the elephants pink, to recall a scene in the film where Dumbo and his mouse pal Timothy accidentally drink a bucket full of champagne and see bright, pink-colored elephants. So the story goes, Walt Disney objected to a ride based on a hallucination and ordered them to paint each elephant gray instead. The nearby ride Casey Jr Circus Train is also based on the Dumbo film. Talk about optics if you want, they're nothing new for politicians. Democratic President Harry Truman refused to ride Dumbo the Flying Elephant because he didn't want to be seen with the symbol of the Republican Party. In 2005, Disneyland donated an original Dumbo the Flying Elephant ride vehicle to the Smithsonian Institution in celebration of Disneyland’s 50th anniversary. Is It Different than Dumbo in Florida? Walt Disney World in Florida has two Dumbo rides, and California has only one, but they’re all pretty much the same.